In his famous 1942 treatise Igor Stravinsky made an extraordinarily prescient claim: An experienced eye follows and judges…the performer’s least gesture. One might only conceive the process of performance as a creation of new values…similar to those which arise in the realm of choreography. Anyone who’s watched Elvin Jones’ flying hands play the drums with primordial fury compared to, say, Max Roach’s balletic, curved gestures knows how directly Jones’ body movements change the sounds we hear. He does not ever treat his instrument with kid gloves: his moves are brutal, physical and yet surgically precise. The whole chemistry between musician and music changes as Jones moves into overdrive. His face darkens, his mood changes and his body language becomes ferocious and magisterial. Any musician – especially a drummer – who is courageous enough to pay homage to Elvin Jones must bow low and have an almost intuitive understanding of where the great drummer was coming from. Moreover he must also be worthy of aligning himself to the legendary ancestry to which Elvin Jones belonged. From evidence presented on numerous recordings including those with Living Colour and those made in his own name, Will Calhoun has perfect credentials. With lurching shoulders and hands flailing as if in flames, Calhoun pays his respects to a legend with a mythic strength and style completely his own. To that end it is rather unfortunate that we have but a few minutes of footage of the making of Celebrating Elvin Jones (shown in the video clip below). However, the memory of Calhoun playing live in other situations must surely linger in the memory long enough to enjoy this recording by. The drummer’s grasp of time is flawless as is his sense of polyrhythmic figures that inform his performance throughout this magnificent disc. Moreover, it is with a classic undertow of African-ness that Will Calhoun adorns melodies especially in his use of the dropping of depth bombs on the bass drum in rhythmic cycles as he engages in conversations with the rest of his battery of percussion instruments. Here, Calhoun pays special tribute to the late Senegalese master drummer, Doudou N’Diaye Rose in a beautifully played ‘Doll Of The Bride’, on which Doudou N’Diaye Rose himself appears with a rather mysteriously named ‘5 Group Drummers’. The explosive power with which the celebratory album opens on Jones’ rarely-heard ‘EJ Blues’ foretells the marvels that are to come. As the invigorating repertoire unfolds, so does a magical picture of the ghost of Elvin Jones. The musical séance provides the atmosphere for the conjuring of Jones spirit throughout. His association with John Coltrane’s ‘classic quartet’ is represented by another rarely heard piece by Coltrane: ‘Harmonique’. Jones’ love for things Japanese – and his own living link (by marriage) to Japanese culture comes alive with Calhoun’s superb rendition of the traditional ‘Doll Of The Bride’ and with ‘Shinjitsu’. Along the way we also hear Wayne Shorter’s ‘Mahjong’ played with beautiful tonal patches and references to Japanese tradition. The record ends with ‘Destiny’, an iconic piece from the songbook created by Elvin Jones’ group that included Jan Hammer and Gene Perla on the classic 1975 date that produced Elvin Jones in “On The Mountain”. If the listener was not already left speechless by Calhoun’s artistry by then, he might surely be left quite breathless as the song brings this album to a close. This may be Calhoun’s record, and although the drummer brings an ever-throbbing heartbeat to the music, the whole is only as strong as the sum of its parts. Contained within is the drummer’s virtual doppelgänger and bassist Christian McBride, and pianist Carlos McKinney, who complete the power trio of the rhythm section, with saxophonist Antoine Roney and trumpeter Kenyon Harrold playing additional lead voices. 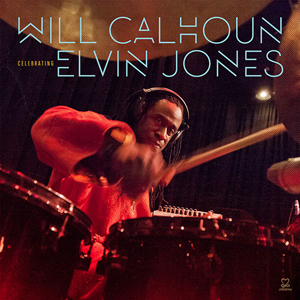 Throughout this experience you will feel the pulse racing as Will Calhoun brings his own genius to bear on creating a moving picture of perhaps the most iconic drummers in Jazz. There’s also the thought that Stravinsky was right: we hear these moves, see the sounds differently as the music echoes even after it has ended. Track List: EJ Blues; Whew; Harmonique; Sarmastah; Mahjong; Shinjitsu; Doll Of The Bridge; Destiny. Personnel: Will Calhoun: drums, 12-string acoustic guitar (4); Christian McBride: bass; Antoine Roney: tenor saxophone, soprano saxophone; Carlos McKinney: piano; Keyon Harrold: trumpet; Jan Hammer: keyboards (8); Doudou N’Diaye Rose and 5 Group Drummers: drums (7). I hadn’t heard about this album! I’m really excited to hear it now! 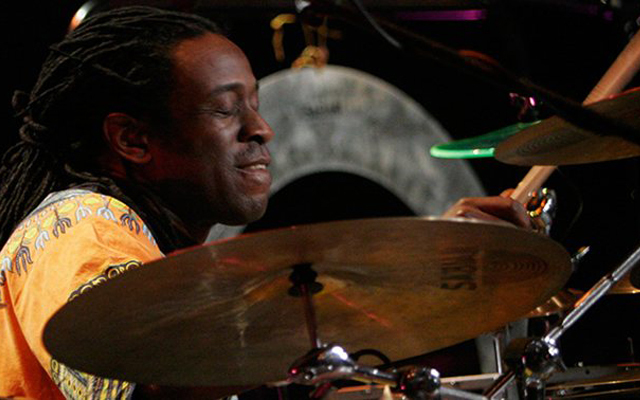 I had the pleasure of meeting Mr Calhoun on a couple of occasions, he is both a class act and an incredible drummer.